The 2014 Broadway World; Long Island Award voting is now open. There are quite a few NFCT productions nominated. Won’t you vote for your favorites? NFCT wins Best of the Best! 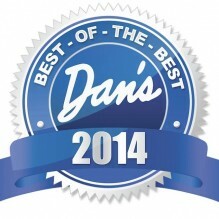 Congratulations to all the winners of Dan’s Papers “Best of the Best-2014” contest (including us!) And a gigantic THANK YOU! to everyone who voted for the NFCT. We can’t do it without you! NFCT to reopen with The Drowsy Chaperone! © 2014 NFCT. All rights reserved.